Pros: The talented cast works wonders with this splendid script. A stunning venue and very cozy bar – a lesson in lighting for any theatre manger! Cons: The actors’ hesitations sometimes disrupted the rhythm of the piece. 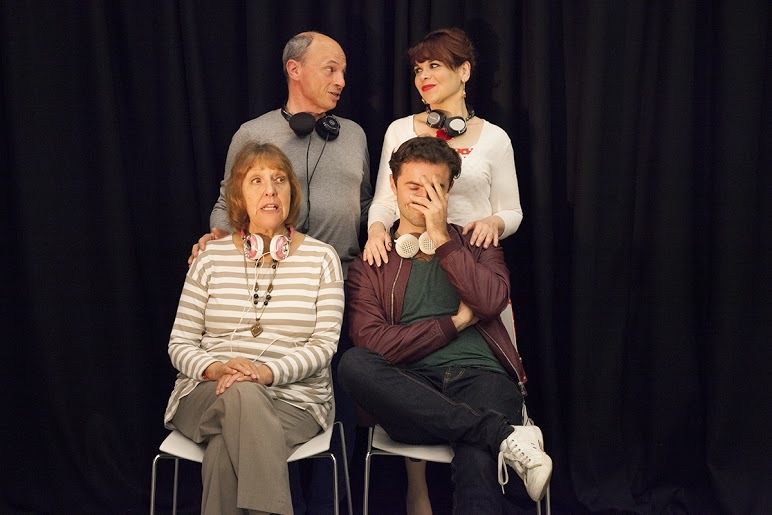 Listen, We’re Family is a verbatim play where a vast array of Jewish characters detail their life adventures and misfortunes, all of which have their links to East London. Writers Kerry Shale and Matthew Lloyd have recorded a rich collection of life stories gathered from interviews with local Jewish families. 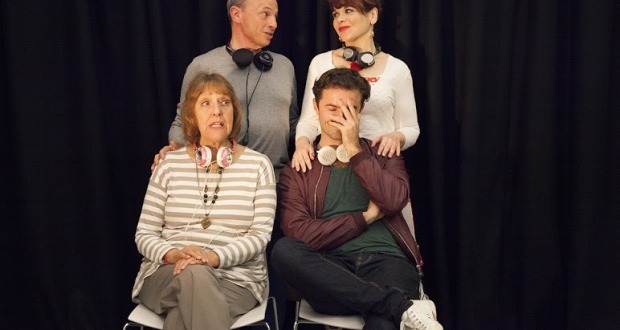 Live on stage, an edited tape of the stories is relayed through earpieces to the four actors, who faithfully reproduce and perform what they hear. This way you get a more authentic taste of how Jewish families sound by staying true to each person’s idiosyncratic ways of speaking. 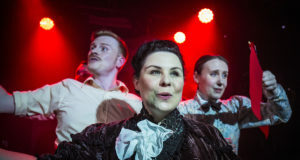 Following a successful run at the JW3 centre on Finchley Road, this production takes place at the glorious Wilton’s Music Hall. The concert hall is stunning; the large stage and fine streams of lights are fixed to a central chandelier and stream their way to all sides of the balcony. The brief interval provides a nice opportunity for the audience to explore the hall. 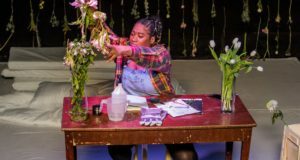 Upon first sight, the set design is most inviting; a medley of the various domestic settings dotted about for the different families to inhabit, such as a garden patio, a typical Jewish living room, and a dining table the length of a double decker bus. The most intriguing item is a barber’s chair. A soundscape of subtle effects throughout, such as passing traffic for the barbershop, helps to transport you to each setting. Each actor plays four characters from four different families. The switches between characters are swift, and it is initially tricky keeping up with the family relationships. (There’s a list of all 16 characters in the programme for anyone who wants the heads up.) All the actors made their mark with at least one of the characters. An older woman’s story of her separation from her husband is particularly poignant, and a wife’s adlibs throughout her husband’s stories got a lot of laughs. A young gay man’s sole commitment to Judaism is to buy bagels from a local market, and a 90-year-old barber steals the show with his Yiddish slang and set ways. I wasn’t able to get a handle on this inventive method of the actors performing the audio playback. For me, it interfered too much with the rhythm of the stories and seemed to create a distance between the actors and the stories they are trying to simultaneously relay and act out. I may be in the minority on this, as there was much laughter and appreciation from the audience throughout. The biggest downside to this show was the very snug seating arrangements. You’re shoulder to shoulder to the people on either side of your very small seat, and it feels unnecessarily restrictive. There are padded cushions available to those who need that bit more comfort and there are plenty welcoming staff on hand to offer assistance. I have a feeling that Wilton’s Music Hall is still somewhat of a hidden treasure. Off a little side street not too far from the Tower of London, you wouldn’t expect the modest entrance (currently under renovation) to house the world’s oldest and last surviving concert music hall. I’m so glad I turned up to the venue early enough to enjoy the many delights of its very own Mahogany Bar. The lighting inside couldn’t be more cozy and atmospheric. And there’s an admirable selection of British brewed beers are definitely worth sampling. Overall, the sheer variation and breath of life issues these stories explore are an important contribution to the local social history and entertaining, even for those who can’t forget about the earpieces.